Three Brothers Racing, a Southern California based motorcycle dealership has teamed up with SRT Off-Road and Husqvarna to expand their racing efforts. The new 3Bros / SRT / Husqvarna Racing Team will include Dalton Shirey, Noah Kepple, Ryan Smith, Austin Walton, and Ciaran Naran. 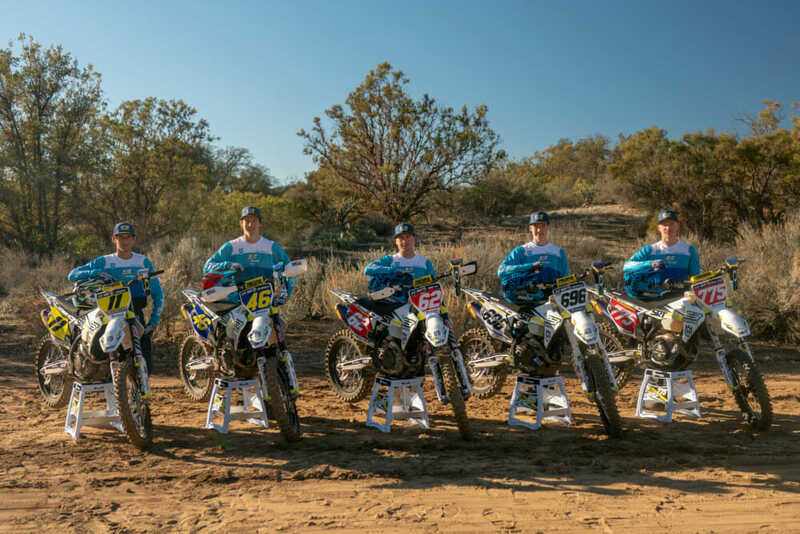 The 2019 3Bros / SRT / Husqvarna Racing Team will include Ciaran Naran (11), Dalton Shirey (46), Ryan Smith (62), Noah Kepple (696) and Austin Walton (775). The riders will contest all the major West coast off-road racing series’, including the AMA National Grand Prix Championship Series, AMA National Hare and Hound Championship, AMA EnduroCross Championship, WORCS, and the AMA District 37 Sprint Enduro Series. Coming off a win at the 2018 NHHA finale, Dalton Shirey will be piloting his Husqvarna FX450 in the Pro classes of the NHHA and WORCS Series’. EnduroCross specialist Noah Kepple will battle at the front of the pack in the EnduroCross series aboard his FC350 while vying for the WORCS Pro 2 championship aboard his FX450. Contending both the AMA National Grand Prix Championship Series and the WORCS Series in the Pro 2 classes will be Ciaran Naran and Austin Walton. Finally, desert ace Ryan Smith will race both the AMA National Hare and Hound Championship and the newly formed AMA District 37 Sprint Enduro Series aboard his 3BROS / SRT backed Husqvarna FX450. In addition, the entire team will race the 3BROS GHR Endurance Series in the Open Pro class. “We have a very strong lineup of 5 racers this year. I am very confident in the teams’ ability and I have good feelings about 2019!” – Team manager Kevin Barbosa. Click here for the latest off-road motorcycle racing news.